The 1899 Marsh was a steam car which was probably never produced in any numbers. From 1900 – 1905, Marsh built motor cycles which were known as Marsh-Metz from 1905 onwards, and from 1905 – 1906 a small car with a 10 hp 2-cylinder air-cooled engine under the hood. In 1909 C. H. Metz bought the Waltham Company and began to make the Metz car. In 1899 the Motor Age published an article entieled "Manufacture in New England." Its sub title read "Impressions from a recent visit to manufacturers and xperimentsrs in the Eastern States - Mention of establishemnts whose work seems likely to become important in the fuuture of motor venhcile Industry." 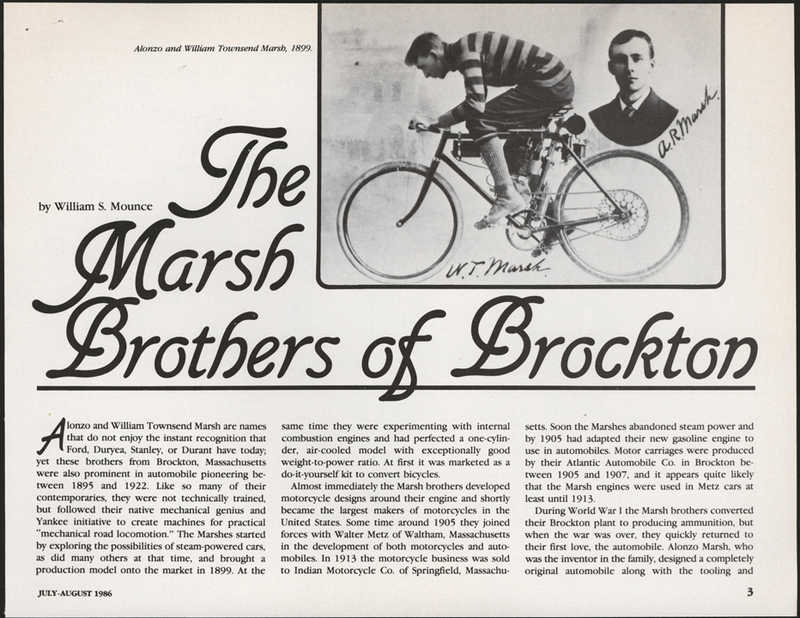 The Marsh brothers were prominently listed, as were other makers and inventors. John A. Conde Collection. William Mounce published this informative article in the AACA magazine, Antique Automobile in 1986. John Conde included it in his Marsh Motor Company file. Georgano, G. N., Encyclopedia of American Automobiles, (New York, E. P. Dutton & Co., 1968), p. 125. Contact us if you have additional information about the Marsh Motor Company, or if you have questions.